Recently a friend of my husband got married. 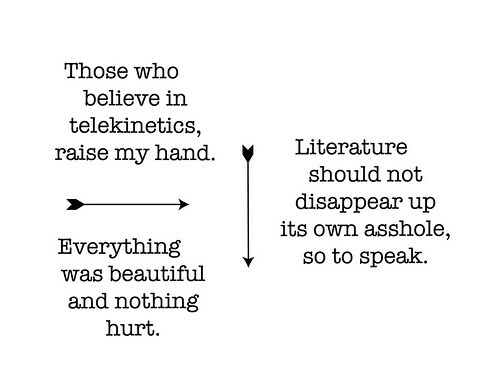 He and my husband often discuss the writings of Kurt Vonnegut. It's kinda their thing. Why am I telling you this? Well, I thought this would be a perfect opportunity for me to take a 'stab' at text embroidery. 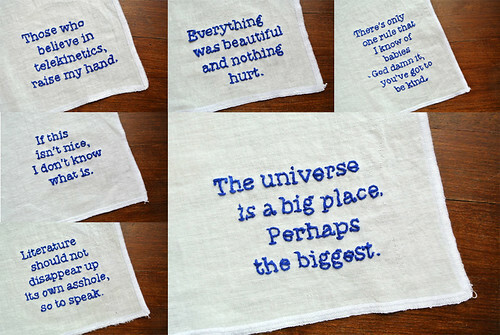 I decided to make the newlyweds a set of napkins with Kurt Vonnegut quotes embroidered on them. 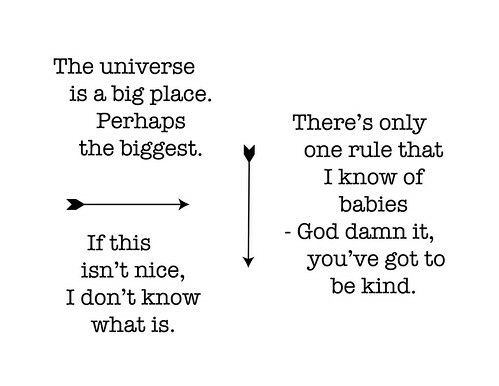 I created my pattern for the quotes in Photoshop. You could make your own text patterns in Word, I'm sure. The font I used is American Typewriter. Crisp and pretty. The fabric I used is the flour sac cloth I already had on hand. I cut them to 16.3 inches by 16.3 inches. Then serged the edges making them 16 inches by 16 inches. I looked online and you can purchase pre-made flour sac cloth napkins to embroider on. To embroider the text I went with the back whipstitch. 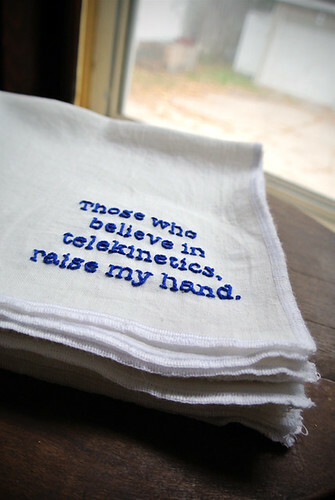 This is an easy stitch that I found works nicely for text. Using just a backstitch makes the text hard to read and lacks in visual impact. Adding the whip gives it a nice embossed quality. Using 3 strands of thread on my needle, I would backstitch a line in a letter and then bring my needle back up threw the first hole. Then I would 'whip' the thread by inserting the needle under the backstitches. Always going in the same direction with the thread, to the left or down. Sometimes on certain letters it will switch directions. It's okay. No one will notice, just a good rule of thumb for consistency. On the periods and dots of the i's I would do a very short single backstitch with the whip. You could also do a French knot.